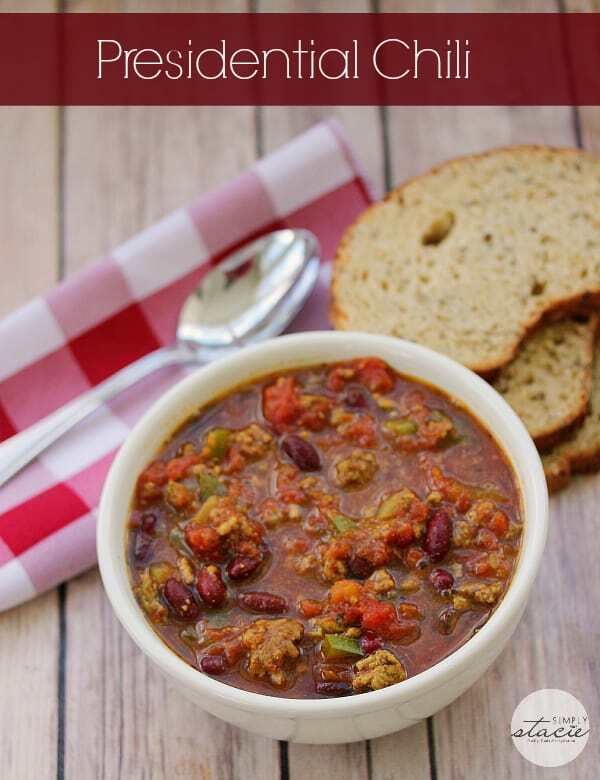 Calling all chili lovers, have I got a recipe for you! This Presidential Chili recipe is packed full of vibrant flavors, tender ground beef, and the right amount of spice. Serve with a dollop of sour cream, oyster crackers, or a sprinkle of sharp cheese over the top. 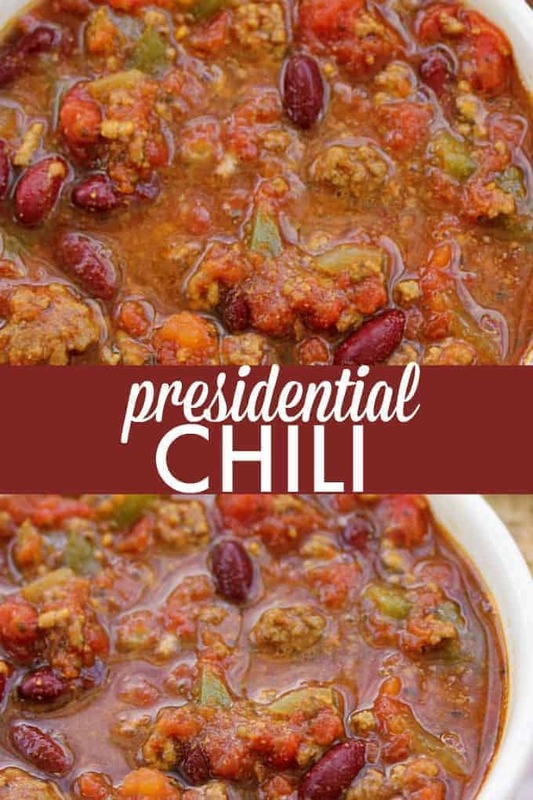 This Presidential Chili will warm you up from the inside out. 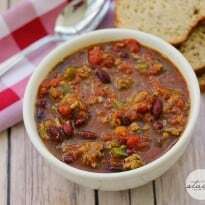 It’s National Chili Day at the end of February so this week the Friday Recipe Club is sharing our favorite chili recipes. 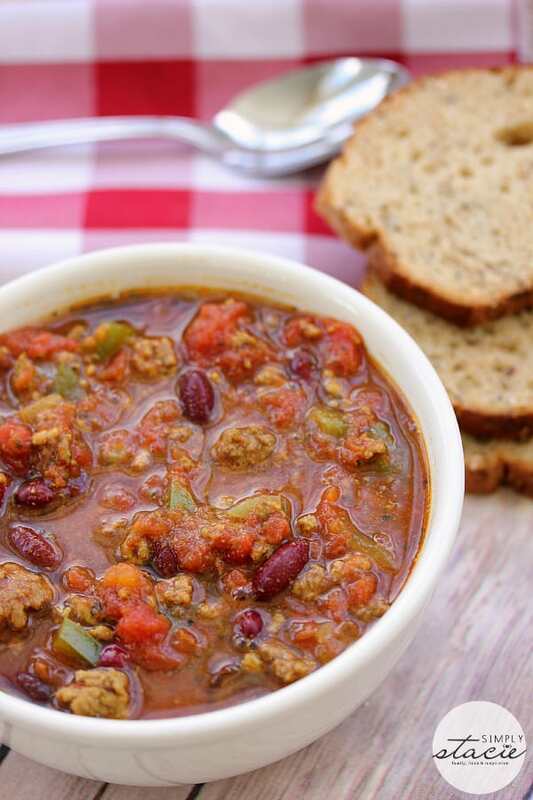 This recipe is an interpretation of President Obama’s family chili recipe! Michelle had shared her husband’s recipe, and it became an instant favorite and that is why it is now called Presidential Chili. For someone who knows chili, I couldn’t pass up giving the recipe a try. It was absolutely delicious, and I think you all will love it as well if you enjoy a meaty and beany style chili. Growing up my mom often made chili. Her recipe included tomatoes, onions, ground beef, mushrooms, green pepper, kidney beans and lots of chili powder. I often make it the same way, but today I wanted to share a slight variation on the recipe. I thought why not step out and try something a bit different. Another yummy chili recipe to try: Taco Chili. I discovered it in one of my cookbooks, Make It Fast, Cook It Slow, but changed a few things. They used ground turkey where I use ground beef. They also used fresh tomatoes and I prefer to use cans of diced tomatoes. This recipe has a few different spices in it like turmeric and basil which I normally don’t put in chili. It also has a secret ingredient: red wine vinegar. Don’t knock it till you try it. It complements the flavors perfectly. I’m adding red wine vinegar to all my chili recipes from now on. It takes the chili to a whole new level of delicious! I told you I can’t help but leave a spot open for chili in my heart. If you want to try some unique chili recipes, here is a handful that I highly recommend! You will be glad you tried them, trust me on this! Okay, some of these ideas on how to eat chili are a little out of the box. BUT, know that some people swear by eating chili this way, and it could be a dynamite combination if you give it a try! Serve over a bed of rice or cauliflower rice | I was a little taken back when I saw this, but a lot of people love it. You will find the rice adds a new dimension to the chili. You drain off some of the broth so it is more the meat and bean mixture. Loaded Potatoes | I love this idea, on using a potato as the base, and pouring chili into the potato and topping with cheese, sour cream, green onions, etc. Fries | Loaded fries are a favorite. Serve up your favorite fries, add on chili, cheese, diced onions, and any other toppings and dive in. Spaghetti Squash | I know someone who cooks up a spaghetti squash and then loads in chili on top. It is like a ‘healthy’ pasta and chili version. They swear by the combo. Taco Salads | We have done this with leftover chili. You cut up a head of lettuce, add on your chili and taco toppings and dive in with some tortillas or Frito chips. It is so delicious. You can totally eat this chili all by itself, and it will be delicious down to the last drop. Or you can reach for a homemade cinnamon roll, to add some sweetness. We grew up dipping fresh cinnamon rolls into our chili at school. Don’t knock it till you try it! Or go for a more savory side and do a cornbread! Both options are really delicious. While I love chili plain, I also love adding new dimensions of flavor by layering on toppings. Here are a handful of popular and tasty toppings to consider. Give this Presidential Chili recipe a try if you are looking to try a different recipe for a change from your traditional chili. While it does have a handful more ingredients, they all work together so nicely to really add dimensions. I also found that the leftovers the next day tasted even better. The flavors sat and really blended even more so the spices came out even stronger. But, I find that happens with a lot of chili recipes. So give it a try and let me know what you guys think. Have you tried out the Presidential Chili Recipe yet? Made with a secret ingredient to take this mouthwatering comfort food to a whole new level of deliciousness! Brown the ground beef on the stove top. Drain the fat and add into your slow cooker. Add the remaining ingredients into the slow cooker and stir to combine. Cover and cook on low heat for 8 hours. Serve over rice or with a slice of bread if desired. Is there suppsed to be water added to this? I didn’t add any, but used the juice in the diced tomatoes. It is chili weather. Thanks for the recipe. G’day Looks warm and welcoming! All blog comments appreciated and sharing is caring today! 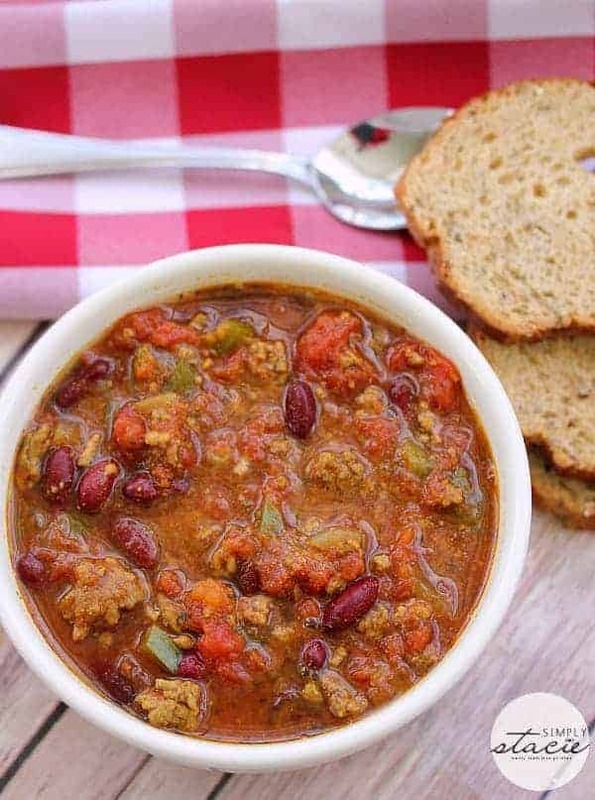 I love chili- this recipe sounds delicious! I love this chili recipe. I’ve used it so many times for family and friends. You should totally enter this chili contest! I think you have a good chance at winning (because I don’t want to steal your credit)! I would make this chili recipe minus the green peppers. I’m liking this version just because it’s always nice to try something new. I bet it’s delicious ! I love that this recipe is not huge, and you have several ingredients I haven’t used before, turmeric, mushrooms and vinegar! Going to pin and try on next Chilly day!Be sure to stop by #omhgww or #omhgff to share!